Great Tastes Tuesdays! : Banana Bread! Have any old bananas hanging around? Don't just throw them away! 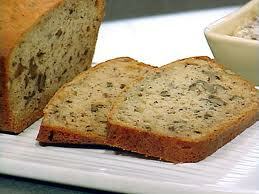 Over-ripened bananas are the best to use in making delicious banana bread. This recipe is the best that I have been able to find and I have used it over and over. I have never been able to mess it up - it has always been one of my favorites. Even when I buy bananas at the grocery store sometimes none of them get eaten? This is a fast recipe that could be made for dinner, dessert or to take to a friend this holiday season! Try it and see the goodness! 1. Grease the bottom of either 1 large bread pan or 2 small bread pans; set aside. Combine your flour, baking powder, baking soda, cinnamon, nutmeg, and 1/4 tsp. of your salt. Make a well in the center of your flour mixture and then set that aside. 2. In a medium bowl combine your 2 beaten eggs, bananas, sugar, and oil. Add your egg mixture all at once to your flour mixture. Stir this until it is just moistened (this should be a little lumpy). Fold in your nuts and then spoon your batter into your prepared pans. If you would like to use the streusel topping sprinkle it over the batter now. 3. Bake in the oven at 350 for 55-60 minutes for the large bread pans, or 40-45 minutes for the small pans. The best is to watch it brown and use a toothpick to stick in the middle and see if it comes out clean. If it is needed cover the bread loosely for the last 15 minutes to prevent over-browning of your bread. Cool in your pan on a wire rack for about 10 minutes and then remove your bread from the pan to let it cool completely. This will help prevent your bread from becoming soggy. This bread is great to eat after it is cooled or even wrapped and stored for the next day. *Note: Nuts are optional. This bread is amazing either way. Also, since I don't usually have the streusal topping right on hand I hardly ever add it, but it is good both ways. DIY: Raspberries, Christmas and Quilts! Mozzarella Sticks - Melt In Your Mouth Good! !